Suppose you purchased a home on a loan in 2005 with an estimated value of $500,000. Fast forward to May 2013 and the home has been devalued to a measly $100,000. Yet, your monthly mortgage payments reflect the initial value of the home and you are no longer able to afford them due to unemployment. Eventually, you must approach the bank and hand over the keys of your apartment, accepting that you are now just another unemployed and homeless Spaniard, amongst hundreds of thousands. Sounds all too familiar for those in similar predicaments living throughout the Western world. According to the current Spanish banking system, after giving back the goods you mortgaged for the loan, you still must pay the remaining sum. For all the previous homeowners, this means the remainder of the “original” value back to the bank—plus interest. This is the all too common scene in Spain: unemployed, homeless, and owing hundreds of thousands to a bank that also owns your apartment. A key factor in understanding the current housing crisis in Spain is to understand its history. This bubble, that began in 1985, became known as the “Spanish Miracle”: a process that placed a post-dictatorship country with a third world economy into the top ten economies in Europe over a few short years. However, with the bubble-burst in 2008, it became painfully clear that most of the “Spanish Miracle” was just smoke. When the collapse of an economy is directly related to a basic need, there are always direct consequences for the general population. At the end of 2012, the Land Registry Information Service announced that an eviction happened every 15 minutes throughout Spain, which is outright alarming for a country with less than 50 million inhabitants. According to the National Institute of Statistics of Spain, the Spanish now boast 3.4 million empty houses, 13.7% of the total housing available. Even after the damaging effects of the mortgage crisis, the Spanish banks continued to provide loans. One must understand that they too had their own assessment and taxation companies that allowed the banks to establish the prices for homes. In short, the banks were encouraging individuals to buy and invest beyond their means. Money has stopped flowing, unemployment has reached astronomic levels (27% in the overall population with 57% of youth unemployed) and the general Spanish population is struggling to pay the unrealistic mortgages. Common sense (and European law) states that when one cannot pay one’s mortgage, one must give the apartment or home that one bought to the bank that issued the loan. The debt is then paid. 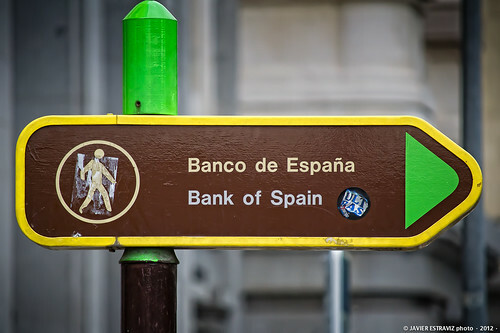 Nevertheless, in Spain, the banks thought differently. This irregularity is attributed to the set-up of Spain’s political, legal, and economical forces having the same faces. CEOs and other figures inside the corporate and banking system were politicians beforehand, and vice versa. The same happens within the legal system. This leads to a lot of “friendships”: which in practical terms mean an astonishingly high level of corruption and impunity to certain individuals and private companies. All the while, one out of five Spaniards live below the poverty line. April 13 occupation in Sabadell, Spain. In response, a gathering of common people who want to take action against those unfair evictions and current circumstances came about: “Plataforma de Afectados por la Hipoteca” – “Platform of those Affected by the Mortgage” (PAH). It is neither politicized nor centralized and it does not have legal status or clear leadership. Separate groups in various cities have been able to gather more than 1.5 million signatures to change the mortgage laws to make evicted people debt-free after eviction. This is a group of dedicated people who advocate for rationally using the estimated 3.44 million empty homes and apartments, now owned by banks, as social rents. Further, the PAH engage in “escarche”: going to a prominent politician’s house who is related with the origin of this problem and putting protest stickers on his door while holding a small demonstration. The absurdity of it all becomes strikingly clear when observing the People’s Party, who have held the majority in government since the crisis began, and their reactions to such “escarche” movements. This April, Maria Dolores de Cospedal, Secretary of the People’s Party, made accusations such as “escarche is pure Nazism,” “the People’s Party voters would rather go hungry before stopping to pay their mortgages.” Other People’s Party members have gone to the extent of relating the PAH to terrorist groups. In the streets of Spain, evictions occur every day; however, so do social movements. For example, on April 13, the PAH occupied a brand new, but vacant, 40-apartment building in the city of Sabadell owned by Caixa Penedes (a Spanish bank). The PAH opened its doors to homeless families after employing a selection process to grant homes to those most in need. Shortly after opening its doors, the police arrived and the peaceful occupation came to a screeching halt through an irregular procedure. Initially, one of the PAH’s lawyers was there to provide representation and act as a mediator to smooth the process should the police arrive, and did so when it happened. Everything seemed to proceed as planned. The surprise arrived the following day when two of the PAH’s members learned that they were facing criminal charges. The police also charged the lawyer, a third party, with disobedience and resistance to the authority. The lawyer is now facing trial, with the police seeking to place her behind bars for six months to one year. In defense of the lawyer, stand the PAH members as well as other “formal” organizations such as the Lawyers Guild and the City Council of Sabadell. Housing is currently a pressing issue in Spain—with the unaffordable mortgages and high unemployment, one must question when this social crisis will transform into a mass revolt. On the other hand… Hey! It’s cheaper to buy a house now! So invest, invest, and invest! I’ll lend you the money, because, well, I’m telling you, it has to work, it’s perfect, and it can’t fail! Then, one wonders, why people in Spain are not happy. One of the most heard slogans during Franco’s dictatorial Regime in Spain was “España: una, grande y libre” (“Spain: one, big and free”). Well, Franco clearly didn’t create a free Spain, and it isn’t a big country per se. What was accomplished least of all was the creation ofone Spain. With several kingdoms and wars, and a relatively recent civil war that led to the actual shape of the country; with five official languages and some unofficial others; there are several Spains in Spain. Some regions have reconciled with the central government through history. But with the actual Spanish and global crisis, and the management of the governments of the last years, the nationalistic feeling has strengthened in other regions. That may be the case of Catalunya (Catalonia), which now seems to be pushing toward its independence from Spain. This past Sunday, November 25th, the Spanish region of Catalonia held a much-anticipated election after only two years of the right-Catalanist Convergencia i Unió (CiU) party government. The Catalan president, Artur Mas, called the population to the polls with a semi-messianic campaign. He promised strong policies towards a relatively imminent independence from Spain. After such campaigning, everyone, including the opposition, expected strong results for Mas’ CiU. The results, however, displayed something quite different from what Artur Mas, analysts, and media statistics anticipated. CiU received only 50 out of 135 total seats in the parliament. This is 12 less than the 62 they previously held. The irony is that CiU called for these elections, hoping to gain more than the 68 seats they needed for a majority. Instead, they now have just 30 percent of the votes, while four other parties hold between 12 and 20 percent. Such a colorful Catalan parliament as this forces CiU to negotiate with other political parties, in order to keep governing. Artur Mas’ peculiar campaign is partially to blame for the results. After several opportunistic movements in 2012, Mas called the Catalan population to the streets on the 11th of September, for the traditional walk for independence on the national day of Catalonia. While expectations were high, the results were overwhelming. More than 1.5 million people strutted through the streets of Barcelona (out of the nearly 7 million Catalans), waving the independence flag and calling for a change. Two days after the march, Mas called for the anticipated elections to be held on November 25th. Mas’ CiU planned the elections, and the other parties were ill-prepared while the CiU was strong and ready. For the campaign, CiU prepared the above poster where Mas appears in a messianic pose, with the slogan “The Will of a Nation” – assuming the 11th of September demonstrations as a sign of strength. The speeches that Mas held during the two months previous to the election were full of references to how he was leading Catalonia through its independence process; how Spain wasn’t treating Catalonia fairly both at an economical and sociopolitical level, and how CiU was the only option. He was apparently attempting to achieve the impossible, to be “the flag” of independence himself. Post-election results show two different things. First, and beautifully enough, Catalan people believe more than ever in democracy (around 70 percent voter turnout), and second, they are everything but fools. Mas took the 11th of September demonstration personally – but Catalans weren’t answering Mas’ call, they had a call for themselves. They didn’t buy Mas’ speeches – he may have been a good way through independence, but he was not going to “own” it as he so wished. The speeches of Mas rang clear as those from a CiU who was never openly pro-independence. Mas was just being opportunistic this time. In reality, Mas is a CiU that has increased taxes, applied more cuts in social services than has the Spanish Government that Mas so openly criticizes, and simply overridden common sense. Mas is a CiU that has allowed 30 percent of Catalonia’s children to remain in poverty, while maintaining harmful right-wing policies. Catalans might have wanted independence, but it was not CiU’s version of it that they sought. CiU’s failure in the polls is now being used by some to prove how the independence movement is not as strong as the million marcher demonstrations had predicted. But the truth is that the pro-independence feeling, which Mas claimed as his own in order to strengthen his campaign, remains strong and in opposition to him. Mas’ CiU fell from 62 seats in 2010 to 50 seats. Parties with pro-independence referenda on their platforms held only 14 of the total seats in 2010. After the November 2012 election, they represent 87 of the 135 seats. Shared between several parties, the pro-independence seats make up a historical vast majority. Objectively, this means that a possible referendum and further independence are politically and bureaucratically more difficult than if led by a unique party with a vast majority. Nevertheless, it also means that, when held, and if approved, the independence process and what it implies will be shared between several parties, several colors, from the extreme left to the far right. Now the push through self-determination comes from several parties with different ideals, but not under CiU’s flag. The elongated process looks more difficult, but at least it represents a wider spectrum of the population and is democratically stronger.